An unconventional building for unconventional learning. The philosophy of the new Junior School at Camberwell Girls Grammar School was to provide an exemplar of the new education paradigm, which promotes non-conventional, multivalent and student-centric learning environments that optimize learning outcomes. The planning was required to facilitate and support multiple learning settings encompassing singular activities, project-based groups, single classes, multiple class groups and full-school gatherings. All learning areas are interconnected and designed around a Learning Commons. Classrooms can be opened into duplex configurations or extended further into the central space. The Common areas permit multiple configurations for learning and include IT zones, wet areas and strong connections to outdoor areas. The Library area is located within the ground floor Common and was purposefully left open and accessible. The project employs timber in numerous applications. The two-storey volume of the Discovery Centre uses vertical columnar fins of laminated White Cyprus, which provide a visual connection to the surrounding trees and appear to ‘hold’ horizontal boards of Silver Top Ash in place. Stained marine grade plywood sits between the lowest Ash boards and the heads of the glazing. Veneered Brims Board particle board provides sheet cladding externally also, while decking and landscape elements are made from Spotted Gum, and screen and seating elements from Yellow Stringybark. 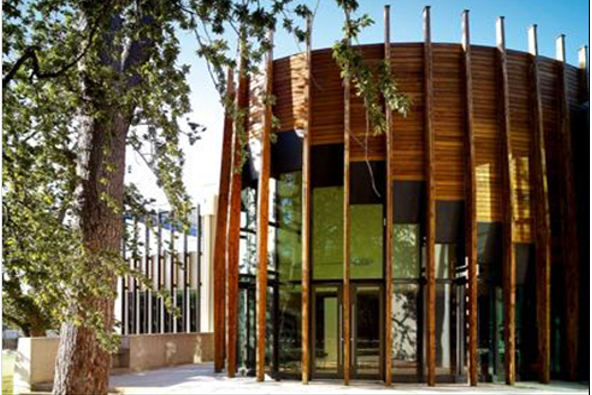 Where the Discovery Centre and Library overlap in plan, the timber cladding of the egg-shaped volume extends into the interior spaces and is read as an interior surface. This ensures that the clarity of the design strategy is experienced by the building’s inhabitants. Plywood panels are used as solid balustrade and ceiling elements around the stair and underside of the mezzanine level, creating a sense that the upper floor and stair are carved from a timber solid. Other internal surfaces are clad with veneered Brims Board particle board.